A man injured in a 2018 suicide bombing that killed dozens rests in a Kabul hospital. The United Nations said today that 2018 was marked by the most civilians killed in Afghanistan’s war since it began counting in 2009. The casualties included 3,804 deaths and 7,189 injured in fighting between the Afghan government, a US-led coalition of Western military forces, the Taliban, the Afghan branch of ISIS, and other unidentified militias. More than 32,000 civilians have been killed in Afghanistan in the last decade. If the US had the same proportion of its population killed in internal conflicts as Afghanistan in 2018 alone, approximately 34,000 Americans would be dead. That’s more than 10 times the number of people killed in the 9/11 attacks. The bulk of the deaths were a result of anti-government suicide bombings that included the deliberately targeted civilians. The 674 civilian casualties attributed to international forces were almost all a result of aerial bombings. 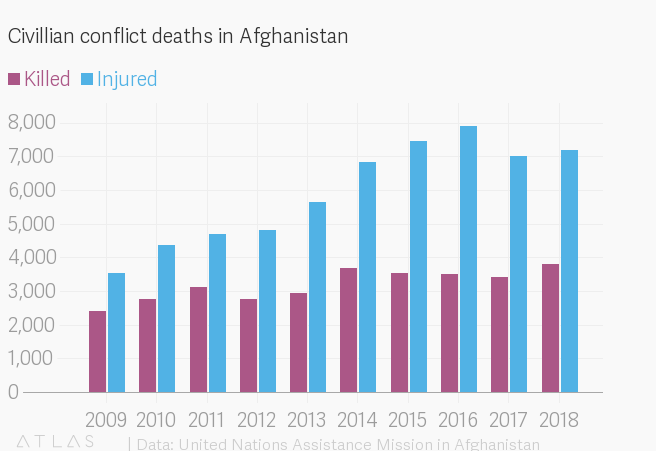 The rise in civilian deaths began as the US pulled the bulk of its troops out of the country under president Barack Obama in 2014 and handed security over to the fragile and little-trusted Afghan government, which in 2017 controlled just 60% of the country. Today, the US has some 15,000 troops supporting combat operations in Afghanistan, compared to the peak of 100,000 in 2010 or 46,000 in 2013. While US generals have long argued that more troops would make it possible to secure Afghanistan, the cost and unpopularity of long-term deployments, combined with the seemingly intractable problems faced in finding a political settlement there, have left many US civilian leaders looking for an easier way out. That includes president Donald Trump, who has loudly proclaimed his desire to withdraw even as the number of soldiers deployed doubled under his watch. The best hope for a resolution now are negotiations between the US and the Taliban, with the next round of talks slated for Monday (Feb. 25) in Qatar. Afghan-born US diplomat Zalmay Kahlilizad will meet with the Taliban’s deputy leader in the highest-level attempt to resolve the conflict thus far. But Afghanistan’s government has been excluded from the talks, and any final settlement will need to find some accommodation between the secular regime led by president Ashraf Ghani and the undefeated Taliban’s vision of an Islamic state.